The calorie count of a grilled-cheese sandwich can add up quickly if you use extra cheese or large amounts of butter or oil. However, grilled cheese can fit into a sensible diet if you use just one cheese slice and no more than 1 teaspoon of fat for grilling. For optimal nutrition, use whole-grain bread and natural cheese, grill in heart-healthy olive oil and add some tomato slices for extra nutrients. To figure out the calorie content of grilled cheese, combine the data from all ingredients. You get about 160 calories in two slices of whole-wheat bread, 115 calories in 1 ounce of cheddar cheese and 40 calories in 1 teaspoon of olive oil or a small pat of butter. That totals 315 calories. Switch to low-fat cheddar, which has about 50 calories per ounce, and the sandwich will now only contain 250 calories. If you're dining out, calorie count depends on the ingredients used. 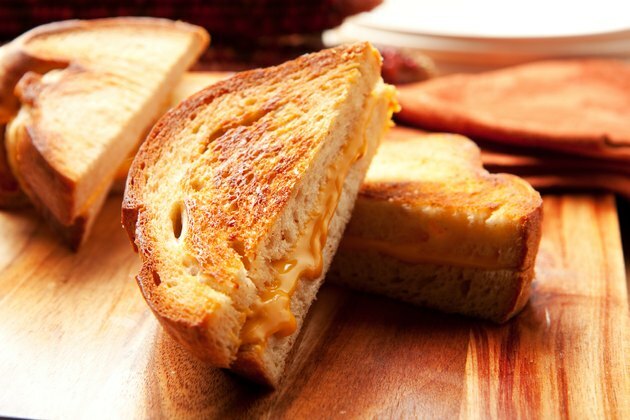 Fast-food, grilled-cheese sandwiches may contain more than 400 calories.